The 6th Annual Barrier Beach Blues and Arts Festival of 2014, produced by Artists in Partnership, Inc, and the Long Beach Public Library, kicks off on Thursday Evening, June 5th with a Blues Open Mic at the Long Beach Hotel and continues on Friday evening June 6th at 7:30 in the Library, 111 West Park Avenue, and through the day and evening on Saturday, June 7th. Headlining this year's festival is Alexis P. Suter and her Band. Join us from 11am to 4:30pm June 7th at Kennedy Plaza in front of City Hall for a day of outdoor family fun, art, music, workshops and the farmer’s market. All events are free and open to the public. 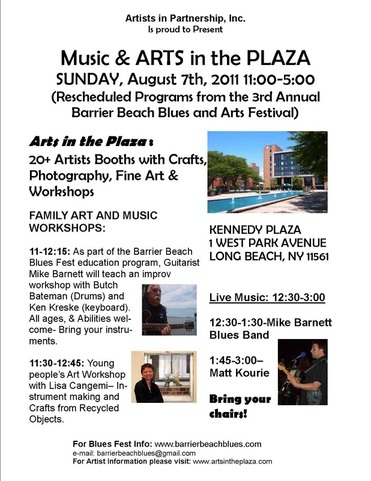 For additional information visit www.barrierbeachblues.com or www.aip-arts.org or call us at (516) 432-6342. Join us at the Long Beach Hotel for Blues Open Mic Night with Benoir and Friends. The Long Beach Public Library is located at 111 West Park Ave.
7:30 - Blues Hall of Fame Night featuring Breakaway - with special guests Michael Packer, Ed Jackson, Sweet Suzi, John Puglisi, and others. 1:30-2:30: Kerry Kearney Trio with Special Guest, Casey Baron: "The Cigar Box Kid"
Lola's Winebar-180 West Park Ave.
All events are FREE! For additional information please e-mail JohannaM at barrierbeachblues@gmail.com. Outdoors at JFK Plaza in front of Long Beach City Hall - the 4th Annual Barrier Beach Blues Festival will be joining forces with the weekly Arts in the Plaza and Farmer's Market projects to bring “Family-Friendly” fine art, craft and photography, "Farm Fresh Fare" vendors, and live Blues Music. Please Bring Chairs. 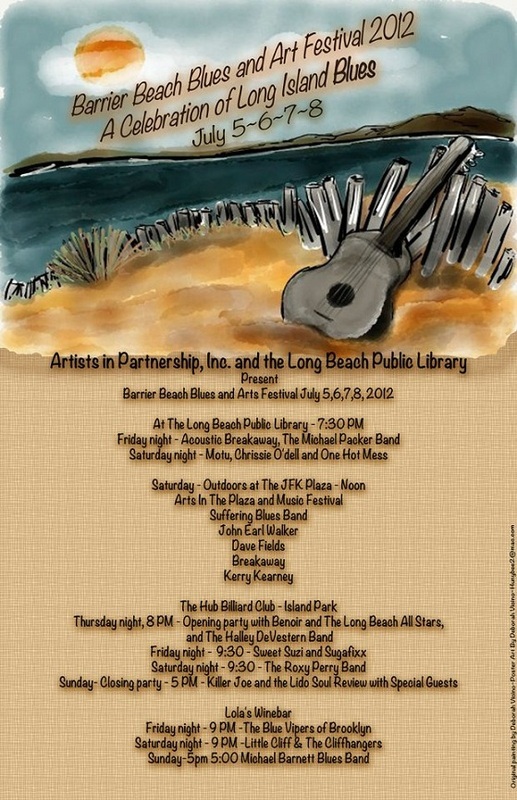 In the event of Rain....concert will be held at the Long Beach Public Library. Early this year, as the Riverhead Blues Festival producers were dealing with the sad demise of their treasured program, Johanna Mathieson-Ellmer was working out the concept for the 3rd Annual Barrier Beach Blues and Arts Festival, a production she refers to as her “David” in the arena of Blues Festival “Goliaths”. 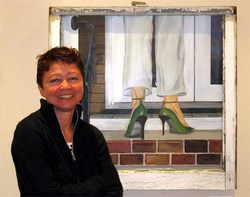 Her two prior festivals, “Ladies Sing the Blues” and the “Delta Blues Experience” were produced in partnership with Artists in partnership, Inc., and the Long Beach Public Library with additional funding provided through the New York State Council on the Arts Long Island Decentralization Grant, and the generosity of individual supporters. Collaborating on this year’s program with Howie Haber, co-producer and member of the Breakaway Blues Band, the decision was made to focus on Memphis Blues as the theme for this year’s art, dance and music festival. A call went out to Blues musicians and performers who, over the years, had won regional competitions here on Long Island, and then went on to represent and compete in the International Competitions in Memphis, Tennessee. The result? Over twenty-five scheduled performances, by Long Island’s top Blues groups, as well as local and nationally recognized Blues performers, Blues dancers and local visual artists and photographers who will be featured in eight venues over the course of five days beginning June 28th through July 3rd. Toby Walker, winner of his division in the International competition, will be featured at the Long Beach Public Library, along with rising “Roots” musician and vocalist Ms. Valerie June who’ll be traveling from her home State of Tennessee to be part of the festivities. The “Better Late than Never….. Jug Band” will provide an educational and fun focus on the instrumentation that is so unique to the Memphis sound. Alexis P. Suter will fill the auditorium with her phenomenal vocal talents and musicians as she takes the stage on Saturday evening, July 2nd. Kerry Kearney and his Louisiana Jamboree, Chrissie O’Dell and One Hot Mess, MOTU, Bennett Harris, Joe Vicino, Sweet Suzi, Ken Korb, Mike Barnett and Li’l Cliff and the Cliffhangers are just some of the featured acts who will be playing in venues in Long Beach and Island Park. On Sunday, July 3rd the Barrier Beach Blues and Arts Festival goes outdoors and partners with “Arts in the Plaza”, bringing music and workshops to Kennedy Plaza. 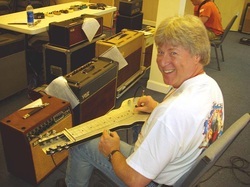 Local Blues legend, Mike Barnett will lead a music workshop for all levels, instruments and ages to participate in. Young people can hone their artistic skills in an art and instrument-making workshop being conducted by local artist, Lisa Cangemi. 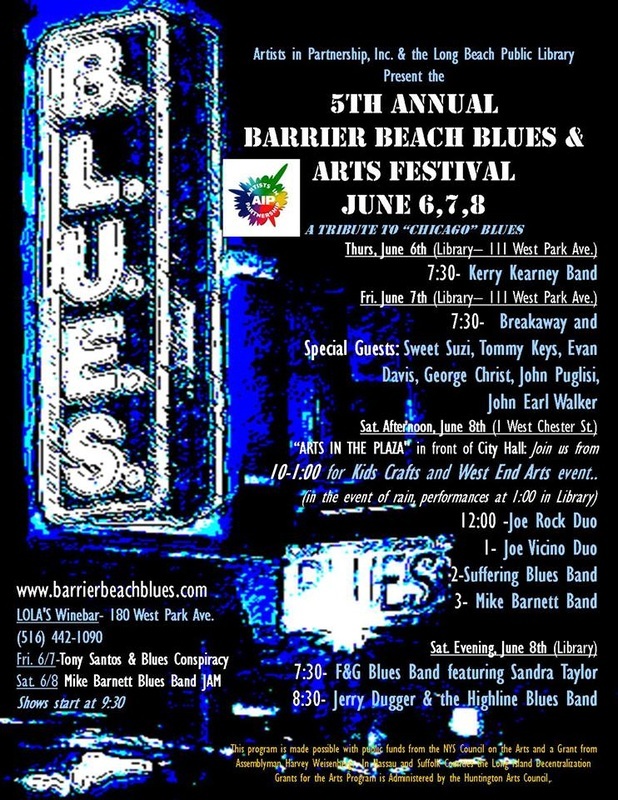 For further information about venues, performers and schedules please visit us at www.barrierbeachblues.com or e-mail us at barrierbeachblues@gmail.com. A Tribute in Memory of Barry Weber. Artists in Partnership, Inc. and the Long Beach Public Library proudly present the 3rd Annual Barrier Beach “Memphis” Blues & Arts Festival featuring Toby Walker, Alexis P. Suter Band, Valerie June, Kerry Kearney, Chrissie O’Dell, the Michael Packer Blues Band and many other (25+) notable performers of Blues Music, Dance & Art Workshops and programs featured in 8 Venues from June 29-July 3. Long Beach Locals can get their “Blues Groove On” early with the SOULAR BLUES JAM featuring jazz and blues vocalist NathalieD, and guitarist Benoir, June 29th from 8-1:00 at the Avenue Café . 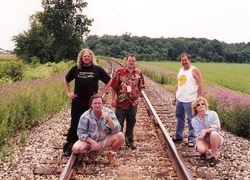 Soular Sounzdz is a weekly event of blues, jazz, and jam band improv and is sponsored by EmPower Solar and Go Green. NathalieD has led original bands at Dizzy's Club at Lincoln Center and St. Nicks Pub, and Benoir wears many hats as an educator, producer, booking agent, multi-instrumentalist and published author. Musicians can mix and mingle all night, order from a full menu and listen to, or sit in on, an all-star jam featuring Barrier Blues artists and locals from 10-1am. The Long Beach Public Library officially opens the Festival on June 30th at 5:45 with an Artists’ Reception for the “ROOTS” themed juried art show hanging in the in the gallery. In the auditorium we will be featuring the sounds and Blues Moves and Grooves of Hether Samuels, the founder and director of JookJoint Shimmy Blues in New York City, and Blues and Lindy dancer Sam Bailor. Hether has brought the joy of blues dancing to hundreds of New York City dancers by organizing dance class series, weekend workshops and blues dances including New York City's annual blues weekend intensive, the NYC Blues Blaze. Live music continues with the “Better Late than Never….Jug Band” and the trio of Chicago born Bluesman, Irving Louis Lattin. Post Library performances include the Gail Storm Trio at Lola’s, Sweet Suzi & SugaFixx at Stone Turtle, the Polly O Band at the Hub Billiard’s Club (where after-hour open jams continue until 4:00 am) and a special tribute to Barry Weber by local musicians and friends at the Avenue Café. Local musician, Peter Kuperschmidt who will be performing at the tribute, was friends with Barry Weber, and he spoke about the things that made him so special. “He was a super nice guy, friendly, loved to talk and play music. His passion for music, the blues and rock was unmistakable. Barry was full of life, passion and ideas. His loss was an enormous hit to the music community. Every time I play my guitar, there is a part of Barry in there. The things he taught me, the ways he inspired me will always be with me! I know many others feel the same way. I am looking forward to playing the blues on June 30th with his Son Adam Weber, Matt Charles and Rob Brower, and many special guests. It will be a great event in memory and honor of Barry Weber”. On Sunday, June 3 at Kennedy Plaza in Long Beach, the 3rd Annual Barrier Beach “Memphis” Blues and Arts Festival joins with ARTS IN THE PLAZA to bring “Family-Friendly” music and arts workshops, live blues music, Fine art, craft and photography vendors. 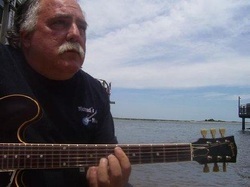 In keeping with the Barrier Beach Blues and Artists in Partnership, Inc.’s educational programming mission, our own local Blues “legend” Mike Barnett will be teaching an Improvisational and comping Blues Music workshop to musicians of all ages, levels and instrument choices. All are welcome Please bring your instruments and chairs to participate in the workshop which is scheduled from 11:00-12:15. Electricity will be provided for amps and instruments. Players and singers of all ages and levels are welcome to participate! Kids are welcome to join professional art director, visual artist, professor and instructor, Lisa L Cangemi, at the Artists in Partnership, Inc. sponsored table featuring hands-on arts, crafts and music activities for kids. The event table offers kids a fun way to express themselves through colors, creativity and sounds. Participants will have an opportunity to 'get creative' with objects and will learn how to design and create their own playful instruments and explore the musical sounds and vibrations generated by their creations. Children’s Blues Jam will wrap up the workshop. All events are FREE! The Children’s Music & Art table will be open from 11:30-12:45pm and will be followed by LIVE Blues music in the Plaza from 1:00-4:00. Join Mike and his Trio at Lolas from 5pm-8pm for Blues, Jazz Standards, originals and a High Octane Jam Session where all musicians and vocalists are invited to sit in. **Reminder About the 3rd annual Barrier Beach “Memphis”Blues and Arts Festival Creative Collaboration. We would like to see a big turnout from the members of the Long Beach Art League, West End Arts, Artists in Partnership, Inc., the Artist Mothers Group, and the South Shore Photo Club for this year’s “Roots”- inspired Blues Festival Competition. Mark your calendar for Saturday, June 25th to submit a maximum of (2) works at the Long Beach Public Library from 11:00-12:00. All art work will be exhibited in the gallery at the Long Beach Public Library to coincide with the 3rd annual Barrier Beach “Memphis”Blues and Arts Festival. ** Once again, this will be a JURIED art show with Ribbons given for each category/ medium. The Artist’s Reception which is scheduled for Thursday, June 30th, 2011 from 5:45-9:00pm in the Long Beach Public Library Auditorium will feature Refreshments, Blues Dancing with DJ Hether Samuels, and Live Music by “The Better Late Than Never Jug Band” and the “Irving Louis Lattin Band”. Please e-mail Johanna M @ barrierbeachblues@gmail.com for further information.